Pat McQuaid will announce if the UCI accept the decision to strip Armstrong of his Tour de France titles at a press conference at noon today. CYCLING’S GOVERNING BODY is set to announce today whether it will ratify Lance Armstrong’s lifetime ban and the loss of seven Tour de France titles ordered by the US Anti-Doping Agency. International Cycling Union (UCI) President Pat McQuaid will announce at a news conference (noon BST) whether the UCI will accept USADA’S decision to strip Armstrong of his Tour titles or appeal to the Court of Arbitration for Sport. Following that, it will be the turn of Tour de France organizers to have their say as the race prepares to celebrate its 100th edition next year. Tour president Christian Prudhomme is awaiting the UCI’s decision, saying he will remove Armstrong’s name from the record books if the UCI takes away his titles. Armstrong won consecutive Tours from 1999-2005. Prudhomme said the Tour will have no official winners for those races if the UCI strips Armstrong of his wins. Cyrille Guimard, a former sprinter who won seven Tour stages, has been highly critical of the UCI and thinks Armstrong may be let off. If Armstrong’s victories are not reassigned there would be a hole in the record books and it would mark a shift from how organizers treated similar cases in the past. When Alberto Contador was stripped of his 2010 Tour victory for a doping violation, organizers awarded the title to Luxembourg’s Andy Schleck. In 2006, Oscar Pereiro was awarded the victory after the doping disqualification of American rider Floyd Landis. USADA also thinks the Tour titles should not be given to other riders who finished on the podium, such was the level of doping during Armstrong’s era. Armstrong has kept a low profile since USADA’s 200-page report stunned the sports world. On Sunday, he greeted about 4,300 cyclists at the Livestrong charity’s fundraiser bike ride, before retreating into privacy as he braced for the UCI’s decision. Armstrong spoke briefly, telling the crowd he’s faced a “very difficult” few weeks. But he did not otherwise mention USADA’s report detailing evidence of performance-enhancing drug use by himself and his teams. “I’ve been better, but I’ve also been worse,” said Armstrong, who has lost some of his big sponsors — like Nike and Trek Bicycle — and also stepped down as chairman of Livestrong. Email “Lance Armstrong case: UCI to announce decision today”. 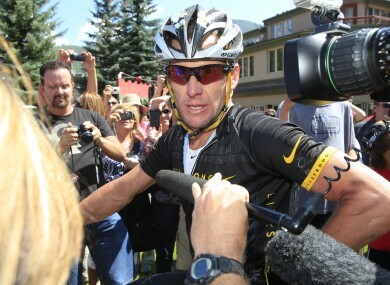 Feedback on “Lance Armstrong case: UCI to announce decision today”.